The purpose of this experiment is to perform a microwave assisted Diels-Alder reaction of 2,3-dimethyl-1,3-butadiene with maleimide. This reaction will take place inside a microwave reactor, which will assist the Diels-Alder reaction and make it happen much faster and more efficiently than it normally would. First, a microwave reaction vessel and small magnetic stirring bar will be obtained from the teaching assistant. The stir bar will be placed into the vessel. Next, 1.28 g of maleimide, 3.00 mL of 2,3-dimethyl-1,3-butadiene, and 3.75 mL of water will be added to the reaction vessel. The teaching assistant will fit the reaction vessel with the top and tighten it with a pre-set torque wrench. The teaching assistant will then help place the reaction vessel into a protective sleeve and into the microwave turntable. The position of the vessel in the turntable will be recorded. The teaching assistant will then turn the microwave reactor on, and the vessels will be heated for 10 total minutes. The reactor will be allowed to cool for 20 minutes after completion of heating. The vessel will then be removed from the reactor and brought to the work area under the hood. The cap of the vessel will be loosened and the vessel will be allowed to vent and cool to room temperature. The white solid inside the vessel will be collected via vacuum filtration. Once the product is dry, it will be weighed and its melting point will be determined using the Mel-Temp apparatus. First, a microwave reaction vessel and a small magnetic stirring bar were obtained. Then added to the vessel were 1.281 g of maleimide, about 3.75 mL of water, and 3.00 mL of 2,3-dimethyl-1,3-butadiene, in that order. The cap of the reaction vessel was fastened using a pre-set torque wrench and it was placed into the microwave reactor. The microwave reactor was then turned on a set to its programmed heating method, in which the temperature was increased to 110 ºC over a 5 minute period and was held at 110 ºC for 5 more minutes. The vessel was then allowed to cool in the reactor for about 25 minutes. The vessel was then brought to the work area and the cap was removed. The vessel was allowed to cool for a few more minutes, then the solid in the vessel was collected using vacuum filtration. The vessel was washed with cold water to help transfer the product to the filtration device. The product was allowed to air dry for two weeks, and was then weighed and its melting point was determined using a Mel-Temp device. Moles of maleimide was calculated by dividing the weight by the molar weight. The molecular weight of the product was calculated by adding the molecular weight of the two reagents. The theoretical moles of product recovered is the same as the moles of maleimide, which is the limiting reagent. The theoretical weight of the product was found by multiplying the molecular weight by the number of moles. The percent recover was determined by dividing the actual weight recovered by the theoretical weight recovered and multiplying by 100. This was a fairly straightforward lab. I expect the percent recovery to be very high because the microwave reactor is very efficient at speeding up chemical reactions. Microwaves do not produce a lot of excess waste from reactions, so this means most of the chemical reaction that we wanted to take place should have happened, which would result in a high percentage of desired product. The only things that would throw our results off are if we were not able to get all of the product out of the reaction vessel or if cold water was not used in washing it out. If warm water was used, the product would become soluble and it would wash away, leaving a low percent yield. The purpose of this experiment is to identify an unknown proprietary drug using thin-layer chromatography. The unknown’s behavior in thin-layer chromatography will be compared with that of its possible component analgesics. The possible unknowns and their analgesic ingredients will be Anacin (aspirin, caffeine), Excedrin (acetaminophen, caffeine, aspirin), Motrin (ibuprofen), and Tylenol (acetaminophen). About 20-30 mg of each of the four known compounds will be added to the appropriate test tube, and 20-30 mg of the unknown will be added to the test tube marked 3-unk. Next, 0.5 mL of methanol will be added to the four test tubes with known compounds and they will be swirled until all the solid has dissolved. The test tube with unknown will receive 1.0 mL of methanol and a glass stirring rod will be used to mix the sample. Any insoluble material will be allowed to settle. Next, two 3” x 1” sheets of fluorescent TLC silica gel plates will be obtained. Capillary tubes will be used to spot the samples of 1-asp, 2-ace, and 3-unk on the coated side of one plate. The spots are to be evenly spaced, 0.5-1.0 mm in diameter, 1 cm from the bottom of the plate, and at least 0.5 cm from the side of the plate. The plate will be viewed under UV light to make sure that enough of each sample has been applied. Capillary tubes will also be used to spot 3-unk, 4-caf, and 5-ibu on the other plate in the same manner. Again, UV light will be used to make sure enough of each sample has been applied. Then, each TLC plate will be placed spotted end down into a developing jar containing a pool of ethyl acetate that is about 0.5 cm deep. The jar will be capped and when the ethyl acetate rises within 1-2 cm of the top of the TLC plate, the TLC plate will be removed from the jar and allowed to dry. Once dry, the TLC plate will be analyzed under the UV light and the appearance of the spots will be drawn in a laboratory notebook. First, five clean test tubes were labeled 1-asp, 2-ace, 3-unk, 4-caf, and 5-ibu. Twenty to thirty mg of each of the four known compounds were added to the appropriately labeled test tube, and all of the unknown in our given vial, labeled “K”, was added to the vial labeled 3-unk. Next, 0.5 mL of methanol was dispensed into the four test tube containing known compounds, and the test tubes were swirled until the solid had dissolved. Then 1.0 mL of methanol was dispensed into the test tube with the unknown, and it was also swirled until the solid was dissolved. A spatula was used to help mix any solids that were having trouble dissolving. Next, two fluorescent TLC silica gel plates measuring about 3” x 1” were obtained. Micro capillary tubes were used to spot 1-asp, 2-ace, and 3-unk on the coated side of one plate. The spots were evenly spaced and about 1 cm from the bottom of the plate and 0.5 cm from the side of the plate. On the second plate, 3-unk, 4-caf, and 5-ibu were plated in the same manner. The plates were then placed spotted side down in a developing jar that contained a 0.5 cm high pool of ethyl acetate. The lid of the jar was screwed on and the plates were allowed to sit in the jar until the ethyl acetate rose to about 2 cm from the top of the plate. The plates were then removed from the jar and then analyzed under an ultraviolet light. The appearance and measurements of the spots were recorded in a lab notebook. 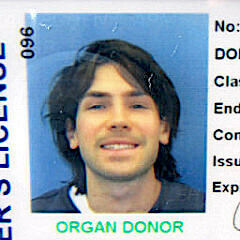 It appears that the unknown contained caffeine and acetaminophen judging by the R­f numbers. The average Rf for unknown spot #1 was 0.24, which is very close to the Rf of caffeine (0.22). The average Rf for unknown spot #2 was 0.58, which is fairly close to the Rf of acetaminophen (0.52). However, none of the unknown drugs contain only caffeine and acetaminophen. Excedrin contains caffeine, acetaminophen, and aspirin, which leads me to believe that we may have misinterpreted our gel when looking at it. It was hard to tell if there some of the streaks actually had spots in them or not, so we may have missed on what should have been a third spot above the acetaminophen spot on our gel plate. This third spot would have been aspirin. I do not remember even seeing a streak above our second spot on the gel plate for the unknown, so this means we may not have spotted enough of the solution on the plate. It could also mean that there is a very low concentration of aspirin in Excedrin, which would account for why we could not see it on the gel plate. The purpose of this experiment is to compare the efficiency of simple distillation versus fractional distillation for separation of a mixture of toluene and cyclohexane. The mixture will first be separated using fractional distillation. A fractional distillation apparatus will be set up and a Thermowell heater containing sand will be used as the heat source. The mixture will be brought to a boil and slowly condensed. The temperature as a function of the number of drops will be recorded along with boiling point versus the number of drops distilled. Three fractions will be collected representing “pure cyclohexane”, changeover fraction, and “pure toluene”. These three fractions and the undistilled sample of the original mixture will then be analyzed using gas chromatography. A simple distillation apparatus will then be set up and a Thermowell heater containing sand will also be used as the heat source. The mixture will be slowly heated and condensed. The temperature as a function of the number of drops will again be recorded. Only one fraction will be collected for the simple distillation. Fractional distillation will take place first. A 10 cm column will be packed with steel sponge. Then 3 mL of the unknown mixture of cyclohexane and toluene will be added to the 5 mL short-necked flask along with several boiling chips. The unknown mixture given will be recorded. The fractional distillation apparatus will be set up with a cooled vial as a receiver. A Thermowell heater containing sand will be used as the heat source. The mixture will be brought to a boil over the hot sand bath. When the vapor reaches the thermometer bulb, heat will be reduced by shifting some of the sand. The distillation is to take place at a rate no faster than five drops per minute. The temperature as a function of the number of drops will be recorded along with boiling point versus the number of drops distilled. Three separate fractions will be collected representing “pure cyclohexane”, changeover fraction, and “pure toluene”. The receiver will be changed for the first time after the temperature begins to rise after a plateau. The receiver will be changed for the second time after the temperature begins to plateau after the rise. The distillation will be stopped when about 0.3 mL of mixture remains in the flask. 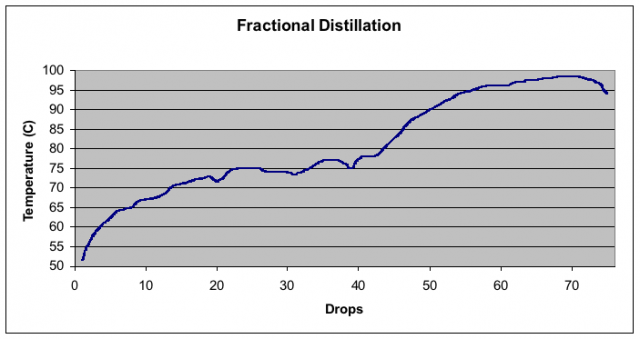 Next, gas chromatography will be used to analyze the three fractions from fractional distillation along with an undistilled sample of the original mixture. The procedure for this part of the experiment will be described during the laboratory lecture. Finally, simple distillation will take place. A simple distillation apparatus will be set up will a cooled vial as a receiver. A 3 mL sample of the unknown mixture of cyclohexane and toluene will be added to the 5 mL short-necked flask along with several boiling chips. A Thermowell heater containing sand will again be used as the heat source. As the vapor reaches the thermometer bulb, the heat will be reduced by shifting some of the sand. The distillation will take place at a rate no higher than five drops per minute. The temperature as a function of the number of drops will be recorded along with boiling point versus the number of drops distilled. Distillation will be stopped when about 0.3 mL of mixture remains in the flask. First, a simple distillation took place. Four mL of an unknown mixture of cyclohexane and toluene labeled “unknown A” was dispensed into a 5 mL short-necked flask along with a few boiling chips. A simple distillation apparatus was set up using a sand bath as the heating source. A water cooled condenser was used to cool and condense the gas into a vial. The temperature was recorded as after each drop of the liquid into the vial. Distillation was ceased when there was only about 0.3 mL of unknown remaining in the flask. Next a fractional distillation took place. Four mL of “unknown A” was again dispensed into a 5 mL short-necked flask along with a few boiling chips. A fractional distillation apparatus was set up using a sand bath as the heating source. The 10 cm column was fairly loosely packed with steel sponge. A water cooled condenser was used to cool and condense the gas into a vial. The temperature was recorded after each drop of the liquid into the vial. 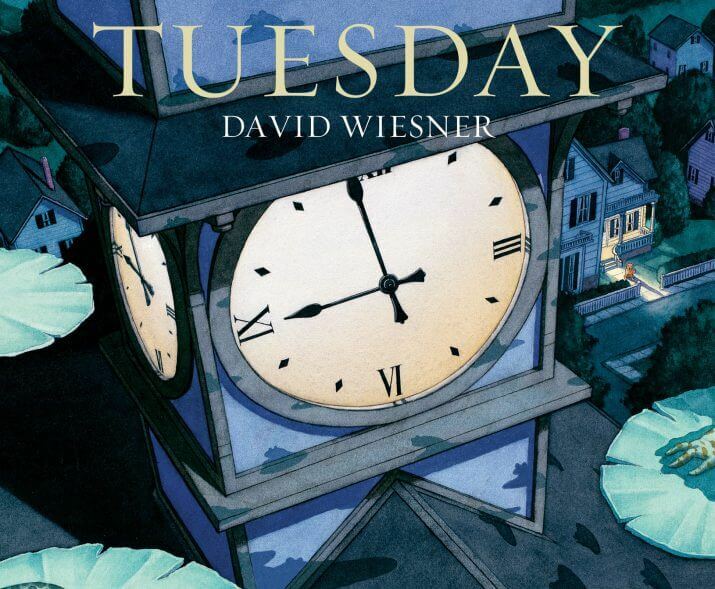 The temperature rose and plateaued at first, and after it started rising again a new vial was used to collect the liquid. After the temperature began to plateau for a second time, a third vial was used to collect the liquid. Distillation was stopped after there was only about 0.3 mL of unknown left in the flask. The three fractions collected were then analyzed and graphed using gas chromatography, which was performed by Dr. Murray. It appears that the fractional distillation was more efficient than the simple distillation. 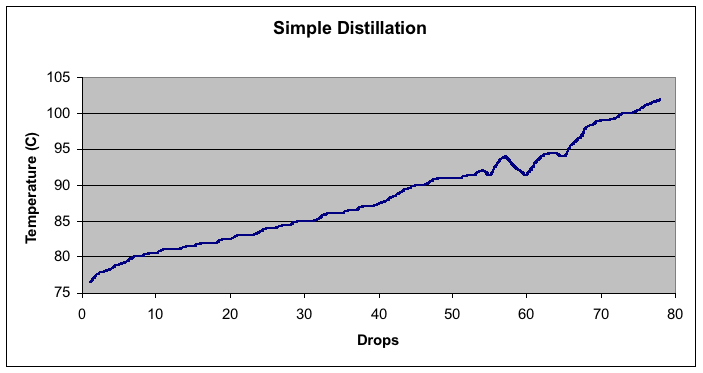 The simple distillation graphed basically as a straight line, but the graph of the fractional distillation actually somewhat shows the plateau where mostly cyclohexane is being condensed and then the rise and second plateau where mostly toluene is being condensed. This can not be really seen in the graph of simple distillation. This may be due in part that the simple distillation was heated too fast. I know that for the fractional distillation it seemed like we heated it at a very steady rate, but the simple distillation was harder to control. This may be why our data did not plot so well. However, in theory the fractional distillation should be more efficient because of the steel sponge. The sponge acted as surface area for gas to condense on. This prevented some of the toluene from condensing into the vial during fraction A because it would condense onto the sponge and drip back down into the flask. The boiling point of toluene is higher than the boiling point of cyclohexane, so the cooler surface of the sponge helped condense toluene, but the cyclohexane still made it to the vial because of its lower boiling point. The sponge helped improve efficiency of the distillation. 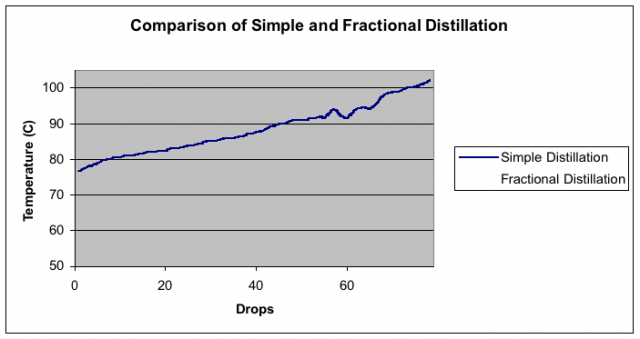 The time required for fractional distillation was greater than the time needed for simple distillation, but it was a much more accurate distillation. The initial composition of the unknown was 46.1% cyclohexane and 53.9% toluene. For fraction A, we ended up with a mixture of 73.4% cyclohexane and 26.6% toluene. I feel that this is a decent result, but it could have been a little better. I think we probably should have switched the vials a few drops earlier, which would have left us with a higher percentage of cyclohexane and lower percentage of toluene. Fraction B ended up with a mixture of 5.5% cyclohexane and 94.5% toluene. The mixture should have ended up more around 50% of each, so this means that we should have switched from vials between fraction B and fraction C sooner. Toward the end of fraction B, pretty much pure toluene was being condensed into the vial, which is probably what threw our numbers off so much. For the final fraction, the mixture ended up being 0.28% cyclohexane and 99.72% toluene. This means that basically pure toluene was all that was left, which is what we were hoping for during the last fraction. We collected 44 drops for fraction A, 17 drops for fraction B, and 14 drops for fraction C. This does not seem proportional considering the original composition was 46.1% cyclohexane and 53.9% toluene. It should have ended up being about an equal volume for fraction A and fraction C, with a lower volume of fraction B. Something like 27 drops for fraction A, 15 drops for fraction B, and 33 drops for fraction C would have been ideal. Overall I feel that what probably cause the most error in this lab was getting the right heat for the sand bath and discerning when to switch vials during fractional distillation. It took a long time before the temperature rose at all, so we could not tell if we were heating the sand bath enough. If we turned the temperature up too much, then the temperature would shoot up when it did begin to rise and that would make it hard to get accurate data. When switching the vials, it seemed that the temperature would hover in a 2 to 3 degree when it plateaued, then it would begin to rise, and I think we let the temperature rise a few degrees too many before switching vials. It was difficult to tell if it was done plateauing or rising.